Enjoy all day usage thanks to the 2600 man battery of the Motorola Moto Z. You'll be able to stream movies, download apps, surf the web safe in the knowledge that 15 minutes of charging with the included TurboPower™ charger will give your Moto Z up to 7 hours of battery life. Enjoy every detail on the 5.5” AMOLED, 1440p Quad HD display, protected by Corning® Gorilla® Glass. Bring your photos and videos to life in ultra-sharp detail with 77% more pixels than a 1080p display. The razor thin Moto Z is construed from military aircraft-grade aluminium and stainless steel making it ultra-light, yet durable. The water-repellent coating also ensures your handset is protected from the inside out. Capture the moment with the 13 Megapixel rear camera with Optical Image Stabilization (OIS), Laser Autofocus and Zero Shutter Lag, or snap the perfect selfie on the 5 megapixel front facing camera. Enjoy an ultra-powerful experience thanks to the Qualcomm®Snapdragon™ 820 processor and 4 GB of blazing-fast Ram. Store more with the 32GB of internal memory and microSD Card support (up to 2 TB). Rest easy knowing your data is secure thanks to the unique fingerprint reader that will recognises your unique fingerprint no matter which way you hold it. 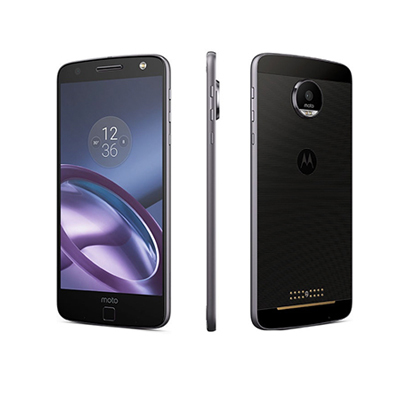 Enhance the use of your Motorola Moto Z with the Moto Mods (sold separately). Attach a separate Speaker Mod, Projector Mod, Battery Mod or Camera Mod using integrated magnets and watch your handset transform.